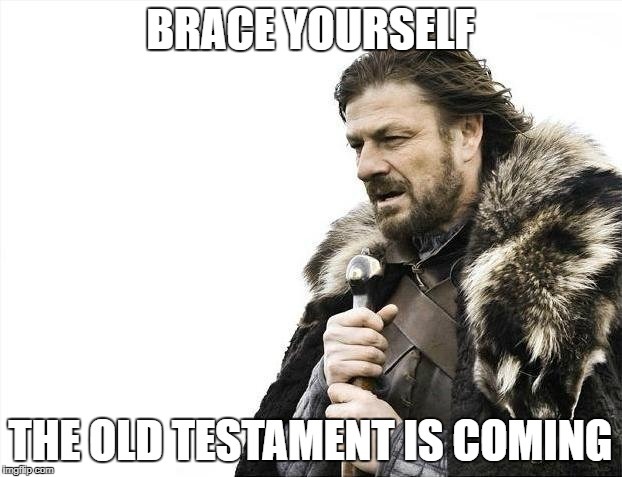 Brace Yourself: The Old Testament is Coming! Mormons around the world at the start of 2018, probably. I get it: the Old Testament is odd and confusing for a lot of reasons, not the least of which being the fact that it was written over 2000 years ago, by a different people in a different time. It feels like so much hard work making sense of it, only to end in confusion and despair. But once you start to understand the Old Testament a little bit, it’s actually a pretty cool book. It does take a little effort to make some sense of it, but it really does not need to be as hard as it feels sometimes. Learning to use the right tools in scripture study—and the study of the Old Testament in particular—can make all the difference. My friend Benjamin Spackman has already make some great recommendations, and he knows OT resources a lot better than I do, so rather than create my list of resources, I’ll just recommend you check out his blog. (And if you feel generous, help him pay his tuition! He’s a starving student for heaven’s sake!) I will emphasize his first recommendation, however: if you struggle with the Old Testament, simply using a more modern translation can do wonders. Taking the extra step and getting an actual study Bible, which will include light notes and commentary, can do even more, and is generally inexpensive and the explanatory notes are written with reglure folk like you and I in mind, so can be very helpful. The Jewish Study Bible, The New Oxford Annotated Bible, or the HarperCollins Study Bible are all great options, and the enrichment to your scripture study will make it well worth the $20–30 investment. But if you want something free, the FaithLife Study Bible app is free for Apple and Android devices. Of course, since none of these are done by LDS scholars you’ll be exposed to some different perspectives, not all of which are consistent or reconcilable with LDS teachings. This may occasionally raise questions for some readers, but that needn’t hold one back from capitalizing on these very useful resources. Any questions that arise can be, and should be, opportunities to explore and learn new things. Another friend of mine, Mike Parker, teaches an adult religion class for his stake down in Hurricane, UT. He makes all his lesson notes and slides freely available online, and the notes and slides for his Old Testament course are another great resource I’d recommend checking out. Mike is LDS (obviously), so his notes and slides can help you get an LDS perspective on various topics and issues, and find more LDS related materials to aide your study. Also, at Book of Mormon Central, we plan to focus many of our KnoWhys on how the Book of Mormon and Old Testament complement each other, and particularly on how the Book of Mormon helps shed light on the Old Testament. So be on the lookout for those! With all of these resources out there, I don’t plan on personally providing any extensive commentary on the Old Testament myself, but I am planning to occasionally blog on Old Testament topics. I’ve got at least 5 or 6 things I’d like to comment on throughout the year, perhaps more, but I won’t commit to anything specific or to making regular Old Testament posts. As I said, I hope to occasionally blog on the Old Testament. In any case, rather than dread the Old Testament this year, make use of some of the resources out there and enjoy this fascinating book of scripture. And if you make it a habit to check back here often, I’ll try to give you a useful insight or two for your trouble. I read the Old Testament, or rather listened to it on tape, for the first time Genesis to Malachi, in 2000. I didn't use any study aids of any kind. 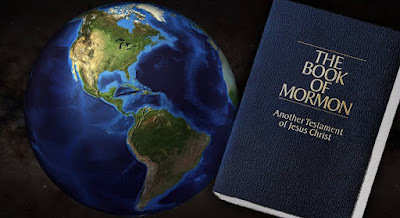 I found it to be easy to understand (other than some, not very important, cultural things) because I'm very familiar with the Book of Mormon, and no matter how much technology, fashion, etc. changes over the centuries, human nature is the same. I love the OT--it is a fascinating glimpse at our ancient brothers and sisters. They go through the same "Pride Cycle" that every civilization goes through, over and over again. The message of each prophet is "You need to repent of your sins! A Savior will come to redeem you! The commandments will bring safety and peace!" We don't need to understand every little thing to understand the message of the prophets, or the Plan of Happiness contained in the OT. Generations of Christians have read, understood and followed the commandments contained in the Bible without any study aids. Not meaning any disrespect to the writers and users of such, but as we read the scriptures we can receive inspiration and understanding through the Spirit for ourselves. Thanks for the tips! Mike's site is very helpful and interesting. Which of the three study bibles do you think is the best? I want to buy one for my kindle. Hard to say. The one I've used the most is the Jewish Study Bible, and I've really enjoyed it, but it (naturally) doesn't have the New Testament.